Brighten your surroundings with an Allsop Home and Garden WheelEasy Holding Yard Cart. Voted one of the Wall Street Journals's top ten gardening products of the year, the WheelEasy line of ground, flush loading garden carts are in a league of their own. 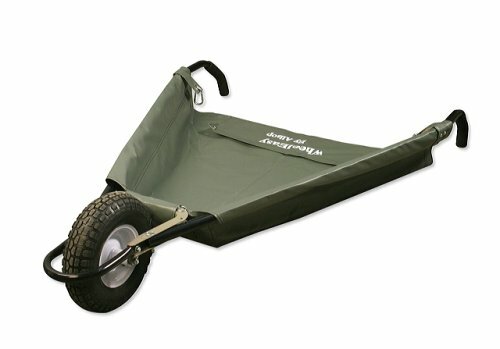 Unlike anything else on the market today, WheelEasy's unique soft, sided canvas barrow lays flat on the ground where gardening takes place. Just sweep, rake, roll, slide or drag directly into the canvas barrow, no heavy or awkward lifting required. The WheelEasy is available in two sizes. Use the original WheelEasy for big jobs, since it has a capacity of 350 lbs and the WheelEasyLE for smaller jobs (150 lb. capacity). Yard work is fun, but we’re always looking for ways to make it easier. Why break your back if you don’t have to? Allsop has a great way to save your back and still get the job done. The WheelEasy is the next step in the evolution of the wheel barrow. But to be technical, it’s unfair to think of it as a wheel barrow. The WheelEasy is a compact and economical collapsible yard cart. It’s the ideal product for yard work ranging from collecting weeds to spreading bark, moving gravel or rocks or even pruning. Seriously, this tool will make the work easier. When you drop the handles to the ground, you get ground, level loading. You don’t need to lift anything to get it into the WheelEasy, just rake, shovel or slide. The only lifting you do is lifting the handles from the ground. And according to the laws of physics, you’re only lifting a portion of the load. Use the WheelEasy to make it easier to replant a shrub, move a boulder, put out some bark or rake some leaves. Use a wheel barrow to mix concrete. This product is guaranteed under warranty one year from original date of purchase, proof of purchase required, manufacturers defect only. In addition to these garden tools check out our array of outdoor solar lighting. Allsop is the founder of the concept "solar garden art". Allsop Home & Garden is known for unique combinations of green solar technology, efficient LED lighting, artisan Hand-blown glass and use of other creative materials with solar power. Allsop Home & Garden is a small family business, started by a father and a daughter who were inspired to create a better wheel barrow. With this in mind, our mission is to create innovative and meaningful products that are as important to you as they are to us. Now, nine years later we are still inspired to create the best, the most innovative and conscientious products possible from original garden tools to solar lighting. Allsop. Illuminate your life. Weighs less than 15lbs and has a collapsible design. Folding yard cart ideal for yard work and moving grass, weeds, bark, soil, plants, branches, rocks, and wood.